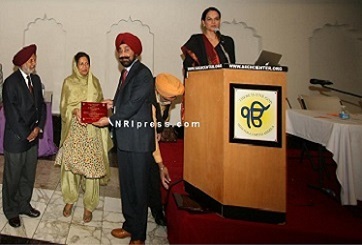 :Sikh Institutions and Gurdwaras of Southern California held an International Sikh Educational Conferences at Sikh Center of Orange County, 2530 Warner Ave, Santa Ana, California. The conference titled "One Granth One Panth and Sikh Rehat Maryada”, was to address recent developments within the Panth that have caused great concern to the Sikh Sangat Globally. The Sikhs living all over the world aspire for strong social unity. They wish to preserve and promote independent Sikh identity as envisioned by Guru Nanak and his nine successors said the organizer Dr. Jasbir Singh Mann. This conference brought into sharp focus the unique features of Sikhism and how they are closely connected with One God, One Guru, One Sikh Scripture [Sri Guru Granth Sahib] which was standardized at Damdama Sahib Sabo Ki Talwandi in 1706 AD. According to Raminderjit Singh Sekhon, one of the participant, oneness of the Sikh Guru Panth is extremely important since it accepted one Code of Conduct: the Sikh Rahit Maryada of 1927- 1945. All these issues are of crucial importance for the Panthic unity, and identity worldwide he said. The topics presented were: (1). One Guru Granth and One Guru Panth, (2). Gurbani Transmission and Validity of Early Sikh Scriptural Manuscripts, (3). Origin, Nature and Significance of Panth approved Sikh Rehat Maryada, (4). Sanatan and Missionary Influence On Sikhism as reflected thru study of Sikh Manuscripts 1642-2012, (5). Kartarpur to the Damdami Version ( Sabo Ki Talwandi), 10th Guru's final Approved Sikh Scripture, (6). Patna Manuscripts: Some Important Features, (7). Sikh Law of Marriage – An Overview, (8). A Critique of the Sikh Gurdwaras Act of 1925, (9). Establishment and Role of Takht Sri Damdama Sahib, (10). Early 19th Century European Travelers on the Sikh Rahit , (11). Tat Khalsa and Schisms of Sikhi: A look into early Rahitnamas and Heretics, (12). Sikh Studies issues and contribution by SGPC Amritsar and DSGMC New Delhi; Critical Appraisal, (13). Gurbani Sangeet: A Search into Its Original Features and compliance Per Panthic Rehat Maryada, (14). Panthic Economic resources Daswand [Charity] and Sikh Institutions of North America: An Appraisal, (15). Sikhism Original Distinct and Revealed religion, (16). Understanding Sikhi in Western Academia, (17). Sikh Sacred Music Performance Practice: Discontents, Solutions, and Hopes, (18). Sociopolitical Impact of Sikh Religious Studies, and (19). Youth perspective of Sikhism. The invited speakers were: Dr. Balwant Singh Dhillon; Guru Nanak Dev University, Amritsar, Dr. Sarbjinder Singh; Punjabi University. 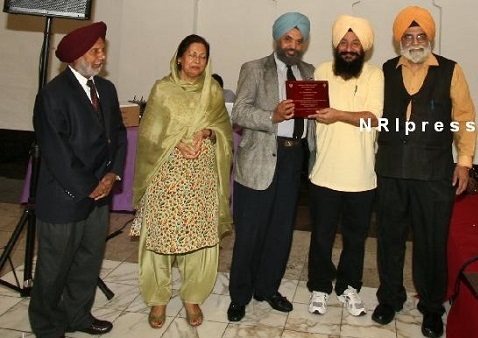 Patiala, Dr. Kashmir Singh; Guru Nanak Dev University, Amritsar, Dr. Kulwinder Singh Bajwa; Punjabi University. Patiala, Dr. Amarjit Singh; Director-Principal Guru Kashi Gurmat Institute, Talwandi Sabo, Bathinda, Dr. Arvinder Singh Chawla; Punjabi University. 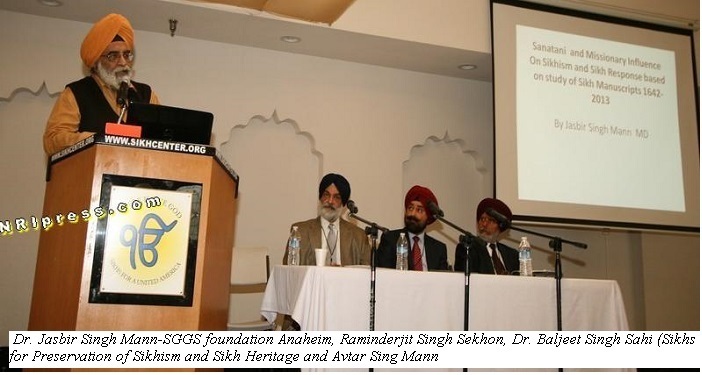 Patiala, Dr. Amar Singh; Punjabi University, Patiala, Dr. Amrik Singh; Cal State University, Sacramento , Dr. Jasbir Singh Mann; SGGS foundation Anaheim, California , Dr. Baljeet Singh Sahi, and Raminderjit Singh Sekhon; Sikhs for Preservation of Sikhism and Sikh Heritage, California. 1. Dr Kashmir Singh has taught law in different Indian Universities for nearly four decades. He retired as a Professor from Guru Nanak Dev University, Amritsar. He also served as the Dean and Head of the Department of Laws there. He is a life member of the Indian Law Institute, New Delhi and was also an executive member of the Institute. He has been a member of Lok Adalt for about a decade. His area of interest is Law relating to Sikhs. He has authored four books focusing on different Sikh Gurdwaras enactments. His articles on Sikh legal affairs has been appearing in Sikh journals like ‘Sikh Review’, Abstracts of Sikh Studies and others and in some books and newspapers. He has contributed in drafting of Pakistan Sikh Marriage Ordinance 2008, some amendments in the Sikh Gurdwaras Act 1925 and All India Sikh Gurdwaras Bill. 5. Jatinder Singh Hundal is an Electronics Engineer by profession. He graduated from Oregon State in 1985. He is currently based in Sacramento as a professional with the State of California. His field of study deals with Sikh Numismatics and history of the community’s struggle for survival. His articles on technical and community issues have appeared in international technical and academic publications. Actively involved in tracing the roots of Sikh sovereignty through linking of history of Sikh Numismatic to current under waves within the community for a homeland. He has been an active participant in community events since 1984 and is involved/aligned with organization dedicated to bringing justice to community’s ill treatment. 6. Dr. Balwant Singh Dhillon; Director, Centre for Studies on Sri Guru Granth Sahib, Guru Nanak Dev University, Amritsar. He has been Professor and Head, Department of Guru Nanak Studies, Dean of Faculty of Humanities and Religious Studies and has also served on the Senate and Syndicate of Guru Nanak Dev University, Amritsar. Graduate of History from Rajasthan Uni & Religious Studies from Pbi Uni, Doctoral Degree from GNDU ‘The Sikh Gurus and the Mughal State’. 34 years teaching and research experience. Specializes in the study and analysis of documents/manuscripts in Rajasthani, Hindi, Gurmukhi and Persian. Keen scholar of religion and literature. So far he has published/edited a dozen of books and contributed more than hundred papers published in research journals, books and encyclopedias. Earlier works ‘Parmukh Sikh te Sikh Panth’ an exhaustive account of the expansion of Sikh Panth during the early 17th century and ‘Early Sikh Scriptural Tradition: Myth and Reality’ responds to the issues of the textual studies of the Sikh scripture. Critical text of ‘Sri Gur Panth Parkash (by Rattan Singh Bhangoo)’. His latest work on the Eighteenth Century Persian Historiography on Banda Singh Bahadur brings into light a number of contemporary and eye witness accounts which have remained ignored by the scholars. Editor of two research journals- Journal of Sikh Studies, and Perspectives on Guru Granth Sahib both published by GNDU. He has organized a number of National and International seminars/conferences at GNDU,North America and Europe. His participation in seminars/conferences at National and International level has been very constant and fruitful. His contribution to the field of Sikh Studies, especially the study of Sikh scripture, history and religion, the Sikh institutions and their role in the formation of Sikh identity, analysis of contemporary sources of the Sikh tradition and several other debatable issues in Sikh history and religion is commendable. Presently he is working on two projects--Rajasthani Sources of the Sikh History and Persian Sources on the Sikh Gurus. 7. Dr. Kulwinder Singh Bajwa :former Associate Professor & in charge Department of Punjab Historical studies, Punjabi University Patiala. He is Ph.D from Guru Nanak dev University. “Historical Analysis of Early Ninteenth Centuary European Travel Literature on the Punjab”. Worked in the Department of History, GNDU as Lecturer.Then Sikh History Research Department at Khalsa College Amritsar more than a decade as Prof. in charge. Participated in 115 National and International Conferences and Seminars in India & Abroad. His Publications include more than five dozen research papers & five Books: (1) Akali Dal Sacha Sauda Bar (ed. ), S.G. P.C. Amritsar 2000 & 2002, (2) A Brief History of Khalsa College Amritsar (1892-2003) Sikh History Research Department Khalsa College Amritsar,2003 (3) Mehma Parkash Vartak (ed.) Singh Brothers, Amritsar (2004), (4) Essays on The Punjab History, Commonwealth New Delhi, (2009), (5) Jetehdar Kartar Singh Jhabbar & Akali Jatha Sacha Sauda Bar, (tr & ed.) The Sikh University Press, 4300, Waremme, Belgium 2010. He Contributed towards the Prepration of a Dosier for Harimandar Sahib-world Heritage Site, Member of 2003 Nanakshahi Calendar Nirnaye Committee ,Khalsa Heritage Museum Anandpur Sahib. Former member Faculty of social sciences, Pbi Uni, Cheif Editor of the Proceedings of Punjab History Conference and The Punjab Past and Present, fellow of Senate of Pbi Uni. Presently working on, Editing of Literature on the Partition of Punjab, A Bibliography on Banda Sing Bhadur and Punjabi Sarot on Banda Singh Bahadur. 8. Dr. Jasbir Singh Mann is an orthopedic surgeon, practicing in California since 1980. Medical Graduate from Punjab uni, Post Graduate from PGI Chandigarh and Columbia Uni. New York. Sikh community activist, a scholar and writer on Sikh Academic issues. His articles have appeared in a range of journals, including Nishaan, The Sikh Review, and Abstracts of Sikh Studies, and in several books. He has co-edited four books on Sikhism. Participated and arranged many international Sikh Studies conferences debating Sikh study issues in 1988, 1990, 1993, 1994, 1995, 1996, 2000, 2004, 2012 and 2013. Recipient of D.Lit. 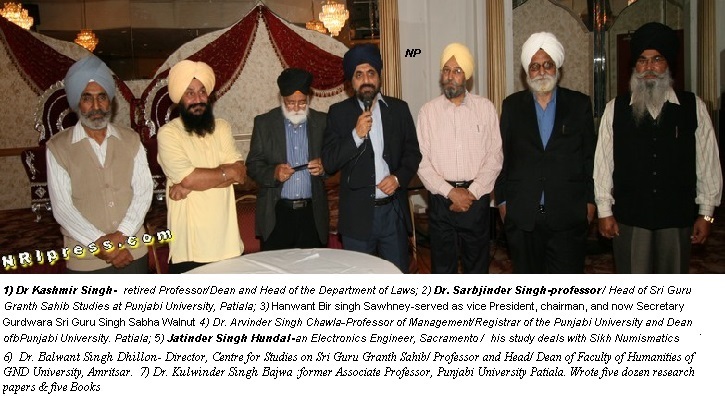 (Honoris causa) from Punjabi University, Patiala in 2001 for his contributions to Sikh studies. He is also a Fellow of the American Academy of Orthopedic Surgeons, a Fellow of the International College of Surgeons and a Fellow of the American College of International Physicians. (2012). His current focus is post Guru history of Sikhs, particularly their armed resistance to suppression in pre and post-independent India and is keenly working on a book. 10. Raminderjit Singh Sekhon is a financial advisor and insurance consultant with a degree in Law and MBA. He is a community leader and has been actively involved with Sikh affairs from past twenty years with special interest in Hermeneutics. He is a frequent visitor to India and Deras to study the schisms and heretics of Sikhism. As an active Sikh member, he regularly lectures in local Gurdwaras. He is also the secretory of Coalition of Gurdwaras of California. He has lectured on various subjects related to Sikh Studies, and Sikhism at Yuba City (2005), Chaffy College Rancho Cucamonga (2006), and University of California Riverside (2008). His current focus is Guru Period and Post Guru history of Sikhs, particularly the anti-Sikh schism and heretics: Nirmalas and Udasis.